Australia - Australian Post Office: 1957-1975. Ordinary rate delivery form: AA-DO-13. 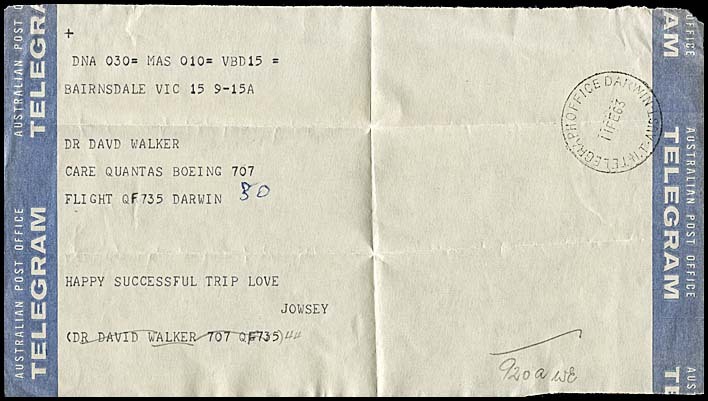 Heading and notes: No form number and four formats in side printing. Colours (text & form): A to C: Blue sides on yellow. Size of form overall: 214 mm. wide. 13D: side mast direct printed in green with "AUSTRALIAN POST OFFICE TELEGRAM" on both sides. Scarce TELEGRAPH OFFICE rubber rectangular date stamp. 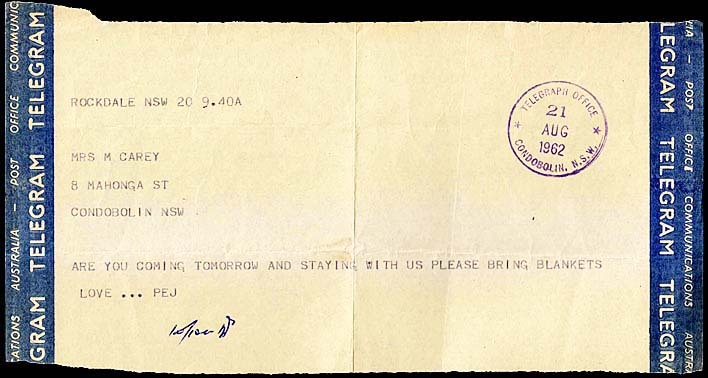 Heading is AUSTRALIAN POST OFFICE TELEGRAM reverse printed in blue. "12. 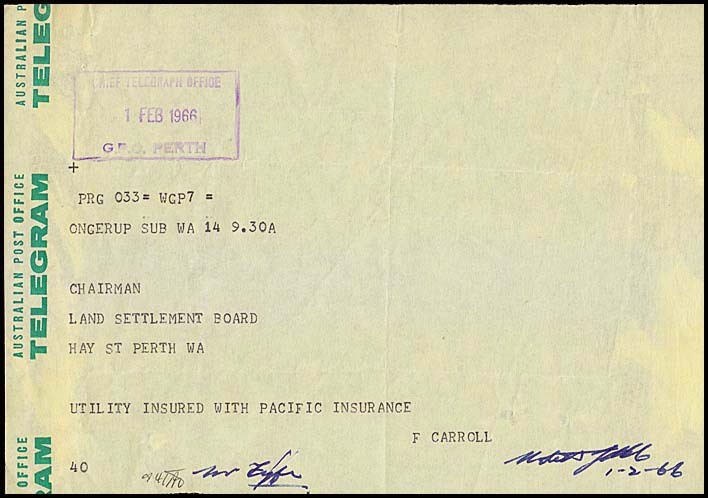 Telegram Forms in Rolls: The side-mast telegram roll TG 42BA, which has been in use for some years, has the wording "Australian Post Office - Telegram" appearing in blue reverse block printing down each side of the roll. However, arrangements have been made to vary the appearance of the next reprint of these rolls. The words showing on the side strip will be the same as on the present rolls but they will be printed in green ink in the clear without the background now produced by the reverse block process. These changes have been adopted with the object of overcoming the problems experienced in securing a satisfactory reproduction of the side printing by the present method. Supplies of the new TG 42BA rolls will be issued from Stores when the existing stocks of rolls become exhausted". Very rare Chief Telegraph Office rubber rectangular date stamp. Form has been trimmed to cut off the sidemast on the right. 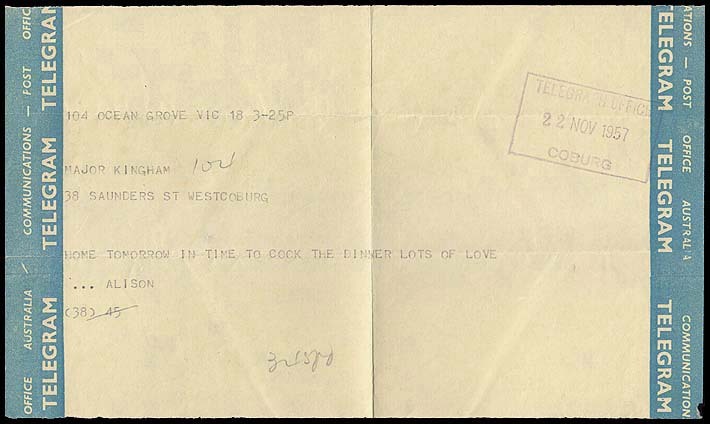 74 mm between consecutive TELEGRAM entries. 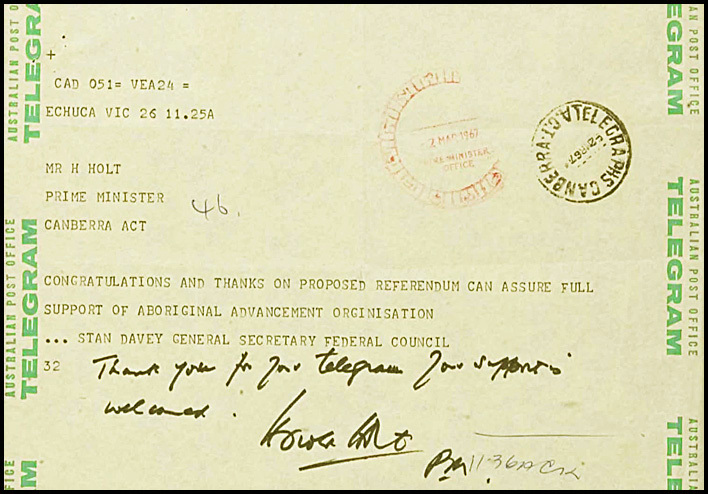 Telegram to Prime Minister Harold Holt. Form shows the usual side masts on both sides. Next (Telecom) delivery form (AT-DO-14). Overview page for Australian ordinary rate delivery forms.